In late August, researchers announced that they had found a breakthrough drug which reduces heart attack risk by one-fourth while cutting the risk of cancer in half. The researchers announced that the new medicine can prevent tens of thousands of deaths from heart attack and cancer. As first reported in the Telegraph, the drug Canakinumab was shown to reduce heart attack risk by one-fourth, while at the same time cutting the risk of cancer in half, and also protecting against inflammation-linked diseases such as arthritis and gout. The new medication Canakinumab, given by injection every three months – cut repeat heart attacks by one-fourth. By comparison, statins only cut the risk by about 15%. Canakinumab hailed as an ally in the war on heart disease. Credit: Doc Jana CC4.0. Professor Paul Ridker of Harvard Medical School and Brigham and Women’s Hospital presented his findings to a large gathering of cardiologists, saying that Canakinumab opens up a ‘third front’ in the war on heart disease. Ridker led a group called the CANTOS Trial Group who conducted the four-year study. Pharmaceutical giant Novartis, the manufacturer of canakinumab, says it will seek FDA approval to treat heart attack victims with the drug. Furthermore, the firm is planning a new phase III clinical trial to use the drug to protect against cancer. While the drug significantly reduced the risk of heart attack and cancer in patients who have had a previous heart attack, researchers are hoping the drug can help healthy people as well. The patients taking canakinumab saw a 15% reduction in deaths from stroke, heart attacks, and cardiovascular disease combined. Members of CANTOS team also observed no serious side effects, and no statistically significant overall survival benefit. Despite that, many observers have hope for canakinumab. David Goff is director of the division of cardiovascular sciences at the National Heart, Lung and Blood Institute. Commenting on the CANTOS study, Dr. Goff stated that the “public health impact potential is really substantial.” Goff estimates 3 million Americans may benefit from canakinumab. Canakinumab, with the trade name Ilaris, is a human monoclonal antibody targeted at interleukin-1 beta (IL-B). The drug was approved for the treatment of cryopyrin-associated periodic syndromes (CAPS) by the FDA in June 2009 and by the European Medicines Agency in October 2009. CAPS is a spectrum of autoinflammatory syndromes including familial cold autoinflammatory syndrome, Muckle–Wells syndrome, and neonatal-onset multisystem inflammatory disease. The FDA approved the use of canakinumab on three additional rare and serious auto-inflammatory diseases in In September 2016, including Hyperimmunoglobulin D Syndrome (HIDS)/Mevalonate Kinase Deficiency (MKD), Tumor Necrosis Factor Receptor Associated Periodic Syndrome (TRAPS), and Familial Mediterranean Fever (FMF). Novartis tried to develop canakinumab as a treatment for rheumatoid arthritis (RA), but this trial was completed in October 2009. 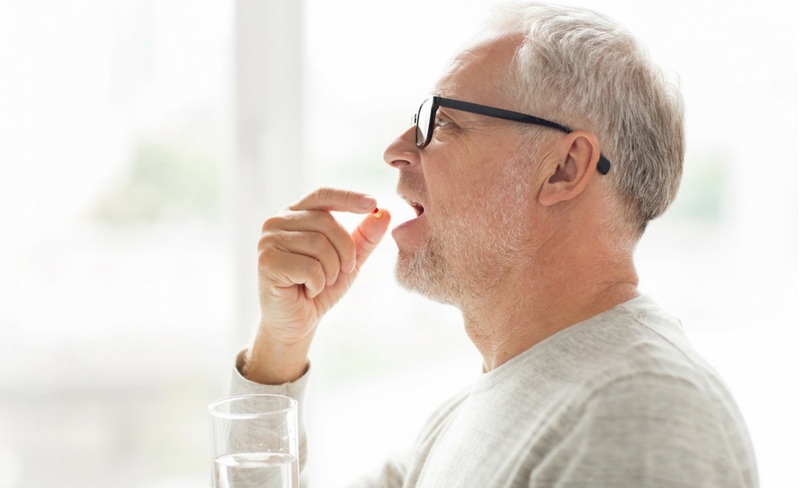 In addition to the CANTOS Trial, the drug is also in phase I clinical trials as a possible treatment for gout and chronic obstructive pulmonary disease (COPD). Canakinumab is also in trials for schizophrenia. Canakinumab works by blocking interleukin-1, part of the immune system and a molecule which contributes to inflammation. The breakthrough drug significantly reduces inflammation, a condition that has also been linked to host of conditions, including, Alzheimer’s and Parkinson’s disease, atherosclerosis and heart disease, cancer, gout, rheumatoid arthritis, and type 2 diabetes. Alzheimer’s Disease strikes about 6% of people over the age of 65. Heart disease and cancer are the two leading causes of death. Type 2 diabetes is also a significant cause of mortality. In fact, a recent study reported that 40% of Americans alive today will get the condition. Chronic inflammation plays such a pivotal role in the diseases of aging that scientists have discovered two other ways to combat it. After our cells divide too many times, they go into a zombie-like state and become known as senescent cells. These zombie cells refuse to do their regular jobs and instead churn out buckets of inflammation-producing molecules. Scientists have recently discovered a new class of drugs called senolytics which remove senescent cells from the body, reducing inflammation. Researchers are currently testing senolytics on patients in clinical trials. Researchers have found another way of reducing the chronic inflammation of aging. Instead of clearing out these zombie cells, scientists have figured out a way to shut them off temporarily. Researchers have recently discovered that the drug rapamycin turns off senescent cells, reducing disease-causing inflammation. Researchers are currently testing rapamycin therapy on patients in clinical trials. Related Topic: Can lowering chronic inflammation reduce heart attacks and cancer? Please share this post and help us spread the word. All it takes is one simple click on any social media link. Paul M Ridker, M.D., et al ., for the CANTOS Trial Group. Antiinflammatory Therapy with Canakinumab for Atherosclerotic Disease. New England Journal of Medicine. August 27, 2017. DOI:10.1056/NEJMoa1707914. Available Online. Robert A. Harrington, M.D. Targeting Inflammation in Coronary Artery Disease. New England Journal of Medicine. [Editorial]. August 27, 2017. DOI:10.1056/NEJMe1709904. Available Online. Carolyn Johnson. “Major drug study opens up vast new opportunities in combating heart disease”. The Washington Post. 27 August 2017. Diagnosis, Advice, and Treatment: This article is intended for informational and educational purposes only and is not a substitute for professional medical advice. The information provided in this report should not be used during any medical emergency or for the diagnosis or treatment of any medical condition. Experimental drugs such as canakinumab are not FDA approved and present additional risks when compared to approved drugs. Consult a licensed physician for the diagnosis and treatment of any and all medical conditions. Call 911 or an equivalent emergency hotline number, for all medical emergencies. As well, consult a licensed physician before changing your diet, supplement or exercise programs. Photos, External Links & Endorsements: This article is not intended to endorse companies, organizations or products. Links to external websites, depiction/mention of company names or brands, are intended only for illustration and do not constitute endorsements.